Our Burial Flag / Medals Display Case American Made Flag Display Case is available in hand-selected Appalachian Hardwood with an elegant Queen Anne Cherry finish or a Rich Stained Walnut finish; also available in Solid Oak with a Golden Oak finish. Each piece comes complete with a durable Masonite backing and 1/8" glass front. A silk-screened, paper, flag front is included for display. The depth between the glass and Masonite is 2 3/8". In addition to honoring our Veterans, this piece is also ideal for display of baby items, wedding momentous, graduation keepsakes . . . the possibilities are endless! We hear from customers all the time who call or write to tell us how nicely their veteran’s medals, flags and certificates look, displayed in our flag and display cases. We’re always thrilled to hear it. We think honoring Veterans is the right thing to do, and we’re going to keep on doing by creating and crafting the best display cases anywhere. We want people to remember that serving in the Armed Forces, regardless of the branch, is one of the most honorable things any person can do for their country. On occasion, those in the service who deserve to be distinguished are given medals, certificates, ribbons, and sometimes flags as a token of appreciation from a grateful nation. We understand what it is to serve this country. Every craftsman employed to construct these beautiful display cases is a veteran of the United States Armed Forces. We put all of our creativity and craftsmanship squarely on the focus on honoring fellow soldiers and heroes. One of the finest display cases we make, the FB-250-SQ Flag Display case is just perfect for displaying medals, certificates, and flags. In addition to honoring our Veterans, this piece is also ideal for display of baby items, wedding mementos, graduation keepsakes . . . the possibilities are endless! Our Burial Flag / Medals Display Case American Made -250-SQ Flag Display Case is available in hand-selected Appalachian Hardwood with an elegant Queen Anne Cherry finish or a Rich Stained Walnut finish. As another option, the case is also available in Solid Oak with a Golden Oak finish. Each piece comes complete with a durable Masonite backing and 1/8" glass front. A silk-screened, paper, flag front is included for display. The depth between the glass and Masonite is 2 3/8". One of the most impressive aspects of this particular Display Case is that it is designed to hold and display an American Flag, along with other things. 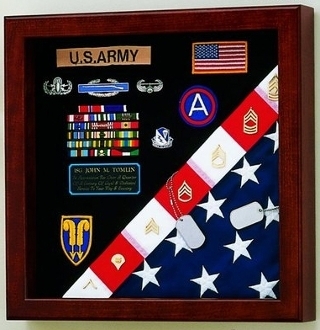 The Burial Flag / Medals Display Case American Made -250-SQ Flag Display Case houses a Memorial 5X9 ½ flag. The way it is designed to cradle the folded Stars and Stripes is a result of the efforts of our craftsmen, who know and understand the Flag means, how it brings us together as a nation. In addition to the Memorial size flag, this display case very smartly shows off every type of medal, ribbon and certificate that is awarded. The design of the case is by us, but you can control the design of your display. Move ribbons and exchange them for certificates or any other honor you would like displayed. However, you like it, it’s yours to arrange. For the inside back wall, velour is used. You have your choice of color: Black, Burgundy, Gray, Green, Red, Navy Blue, or Royal Blue. For an additional charge, we offer Velcro compatible materials in the choice of the colors mentioned above. To keep the legacy of you or your loved one’s service to our country, save and display all the awards you can. The world needs to know about your sacrifice. Your medals point to what you sacrificed and what you sacrificed for. We would be proud to help you display them.